I’ver never been a stereotypical girl, or at least not a girlie girl. As a child, I was more interested in climbing trees and building forts than dressing up as a princess or playing with dolls. As a teenager, I didn’t subscribe to any fashion magazines, and my wardrobe mostly consisted of comfortable Levi’s jeans and t-shirts. Even today, I don’t wear much makeup except for the bit of concealer dabbed beneath my eyes (to hide the dark circles when my young daughter has kept me up most of the night) and a light dusting of powder to dull the shine. My one “girlie” indulgence, however, is my love of shoes. I’m not your typical female shoemonger though. I don’t go on crazy shoe-buying binges. I don’t have a closet full of the latest styles and colors to match every outfit. Hell, I don’t even own a pair of high heels anymore. What I do have is a pair of running shoes (though I never really do much running), a new pair of the Skechers Shape Ups (to help tone my post-childbirth body), a couple pair of comfortable leather loafers (both brown and black) that I used to wear in my early teaching days, and a pair of black leather boots to wear when I feel like dressing up. But none of them even come close to my favorite. I don’t know how many miles I’ve put on these boots since they were first given to me as a gift my sophomore year in college. The mother of one of my dearest friends found them on the shelf at a thrift store. They were brand new, and the price tag said $5.00. How could she possibly resist? They were too big for her, but she thought I would like them. Like them? I wish I could somehow have them permanently attached to my feet. Since the day I got my flowered Docs, I have worn them everywhere–to class, to church, to work, on dates. I was even planning to wear them under my wedding dress until my Mom vetoed the plan. (I did, however, manage to wear them to my “fake” wedding, but that is another story for another time). These days, the soles are worn almost smooth on the outer edges where I have a tendency to walk on the sides of my feet, and the toes are scraped and scuffed. But like all Doc Martens, they were made to last. All these years later, the stitches are still holding tight and even walking through a foot of wet snow, my feet stay warm and dry. The leather is still soft, and the flowers still bright enough to attract comments and curious glances from people I meet on the street. 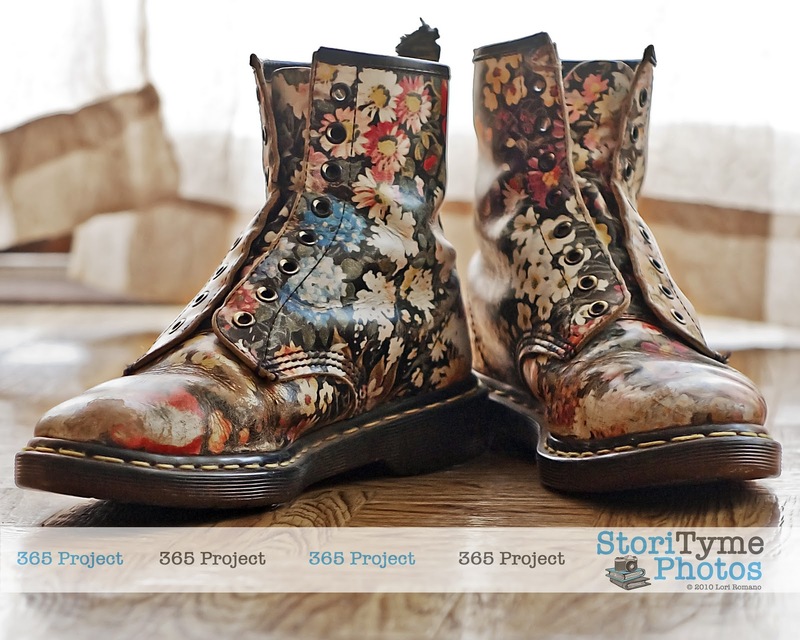 Today’s 365 Project entry is dedicated to my flowered Docs–the best darn pair of shoes I have ever, and will ever own. Thank you Nancy! >I remember those shoes well! >I am almost positive that somewhere in my picture library I have a picture of your feet in these! I remember you had them on during a PD. I can actually picture you outside of the auditorium with them on and me taking your picture while you smiled at me and told me about them being your favorite. I think you were standing next to Lehan…lol. "Memories…."